Norton Security Deluxe 2019. If your device gets a virus we can’t remove, you get your money back . See Norton website for more detail. 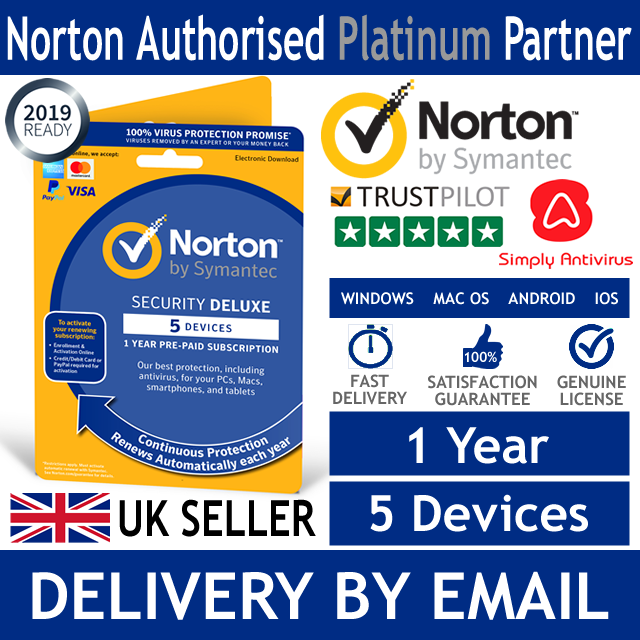 Norton Authorised Platinum Partner, 1 of 2 in the UK. But Norton does. The link supplied took me to a page with several options..I went to the Norton site and found that to proceed one had to get through the payment section so I contacted Norton help line and it took a considerable time for their engineer to install it during this time I had to sign on control of my computer to them....I would not recommend this product...as for 'reliability' and 'performance' how can I comment on this ? This is an up dated version of Norton 360, it is basically the same layout and features but improved virus and malware detection software engine. Reliable and easy to run. With the helpful diagnostics help feature any problems are found and repaired by the software. Have been using Norton for years and always provided good detection rate. This has not slowed my machine and runs quietly in the back ground. When down loading software or up dates will scan and advise you if there is a problem. If surfing the internet it will warn you of suspect website or software trying to be down loaded without your knowledge. Just bought another copy to renew current license for up to 5 machines. If you shop around you can get this at a very reasonable price. I have used Norton for years and always found it reliable and easy to use, with support readily available if needed. It offers full protection and the 10 licence option also has 25gb storage available to use. It comes highly recommended. I do not buy it directly from Norton as their pricing is always much higher and they do not offer discounts that match web pricing. I think they should support their customer base with matched pricing. Excellent product and service from Norton. Good price - 5 devices covered. Had Norton for years. This year I tried another that came free with my new Tablet, found it to be very user un-friendly, and reverted to good old Norton.